Fantastic Location! 2 bed, 2 bath, 2 parking in a secured bldg on the 44th floor with fabulous amenities. Across the street from Ala Moana Shopping Ctr & Ala Moana Beach Park, offering breathtaking views of Waikiki, Ala Moana Beach Park, the ocean, Diamond Head and the Koolau mountains. Hawaiki Tower's premier location offers all the recreational opportunities that Ala Moana has to offer. Relax in the sun on Ala Moana Beach Park's white sand. Walk, jog or bike along miles of scenic manicured paths. Shop daily at Ala Moana's internationally acclaimed shopping center. Close to Waikiki and activities. 1 block from Ward Center/Warehouse/Cinemas Shopping District & Restaurants. This extraordinary and spacious condo has Sub-Zero and Gaggenau appliances, granite countertops, designer cabinetry and full size bathrooms with marble countertops which enhance the contemporary style of this unit. Extremely large and inviting swimming pool, spa/hot tub, sun deck, tennis court, putting green, barbecue areas, playground area, landscaped gardens, a distinctive outdoor deck on the 36th floor, a pet park and a state of the art security system. The name “Hawaiki” is drawn from an old Polynesian form of “Hawaii” and generally refers to the ancient homeland of the Polynesians. It is a name that links Polynesians to a tradition that is rich in honor, security and comfort. It is a dignified name for this very distinctive residential condominium which showcase original artwork by Mary Mitsuda and Glenn Yamanoha of Oahu and Hans Ladislaus and Hiroki Morinoue of the Big Island in the sophisticated lobby and common areas. We stayed a month over the Christmas and New Years Holidays. It was a combination of work and play. Diane, the owner is extremely pleasant to work with and very responsive. She also keeps the unit incredibly well stocked with everything one could possibly need, including additional batteries, cables of all sorts, paper, printer, etc. Her unit is particularly tastefully decorated in rich warm woods and very well organized and practical and very comfortable. She has electric shades, high end appliances including Samsung washer and dryers, three televisions, very soft carpeting and beautiful tile. I had an issue with the ice maker and emailed her at 9pm. The next morning, the repairman was there. He commented that this unit was one of the nicest in the building. I couldn't agree more. I made the mistake of stocking up at Costco on essentials prior to arriving. Diane had plenty of coffee pods, cleaners, TP and paper towels so I ended up leaving lots of supplies I didn't use. The building itself is very well maintained. Wonderful large infinity pool - great for laps. I didn't use the BBQ or tennis courts. My daughter and I walked and/or biked to the Ala Moana park very often to exercise and swim in the ocean. It is much quieter than Waikiki although we did bike there to rent a SUP. Note of caution about biking. Biking on the sidewalks is not allowed in Waikiki itself but is allowed in the parks and most of Honolulu. Lots of restaurants within walking distance, including a movie theater. The unit was exactly as she described and very clean. The other tenants were all very friendly. The parking was especially nice to have. On New Year's Eve, I was working but my daughter saw over 10 fireworks from the unit. The view and sunrises are incredible. I am missing it already. This was the best rental experience I have ever had. Thank you Diane. We recently spent two wonderful months at this condo. 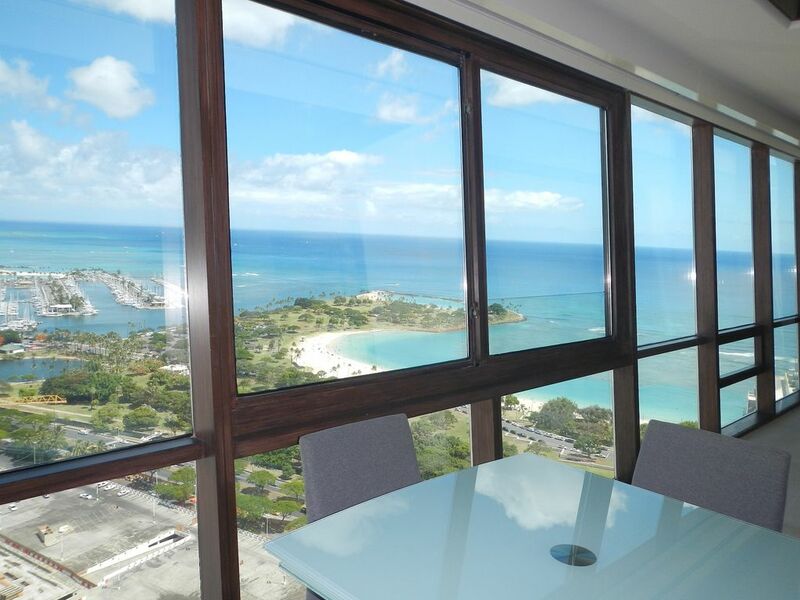 The place has great views of Waikiki, Diamond Head, and Ala Moana beach areas. The two bedrooms are large (the master is huge by Hawaiian standards). The entire condo was recently renovated with high quality throughout. The kitchen is huge and fully stocked. There are three TVs, a nice washer/dryer set, really nicely remodeled bathrooms, all supplies you could need (towels, sheets, beach towels, etc). If you're going to vacation on Oahu for a month or more and want to be in the Honolulu/Waikiki area, I don't know why you wouldn't rent this place instead of a small hotel room in Waikiki -- that will cost you more. Secure dedicated parking is available in the attached parking garage. You won't want for anything while staying here. Diane, the owner, was very helpful and accommodating for us. We had a few issues while there (portable phone stopped working, one of the key fobs died, etc.) that were taken care of quickly. I wish all landlords were as helpful! Without a doubt, when we leave Oahu permanently for the mainland, we'll try to book another month in this fantastic condo before leaving Paradise. We stayed here as we waited for our housing unit on a military base to become available. we treated this like a staycation and enjoyed becoming familiar with Honolulu. We created memories that will last a lifetime and can honestly say that our stay here played a significant part in it. What an outstanding condo with high end features throughout. Exceptional location with breathtaking views of Diamond Head and Waikiki. The convenience of being right across the street from the Ala Moana Mall provides countless eating choices if you don't feel like cooking. In addition to the mall, there is plenty to do within walking distance to the condo. The unit itself is impressive with upscale amenties with everything you need to enjoy your stay. Just pack your suitcase, show up and it's like being home...only better. We enjoyed the Waikiki fireworks display from the dining room every Friday night at 7pm...what a view! We were also fortunate to stay here during the New Year and again witnessed some of the best Fireworks display, all from the comfort of the condo. Additionally, we always made it a point to the sleep with the window shade up so we could wake up to the awesome sunrise over the mountains. We spent 5 weeks in this condo and the time went by too fast. The owner was very accommodating and did everything possible to ensure we had a great stay. We will definitely stay here again when we get the chance. Standard Rate: $6500 | Holiday Season $7500 & Winter/Summer/Spring Season: $7000 + tax, cleaning fee $200, $250 cap on electric/month, $1000 damage deposit.